5 ORTELIUS, A. Asiae /Europae /Americae /Africae. Anvers, 1595. Beau col. ancien. Ensemble de 4 continents parfaitement homog�ne dans un magnifique coloris d'�poque. Les lettrines au verso sont �galement en coloris d'�poque. - Homogenous set of 4 continents beautifully original coloured with ornamental initials on verso also originaly coloured. Repair of split lower part center fold only in the margin. Marginal discolouration along centre fold. 370 x 500 mm. � Splendide ensemble comprenant les 4 continents en coloris d'�poque d'une tr�s grande fra�cheur. C'est la 3e version de la carte d'Am�rique, elle a �t� enti�rement regrav�e et ensuite publi�e dans l'atlas � partir de 1588. Elle a �t� corrig�e et la protub�rance au niveau du Chili a �t� retir�e. 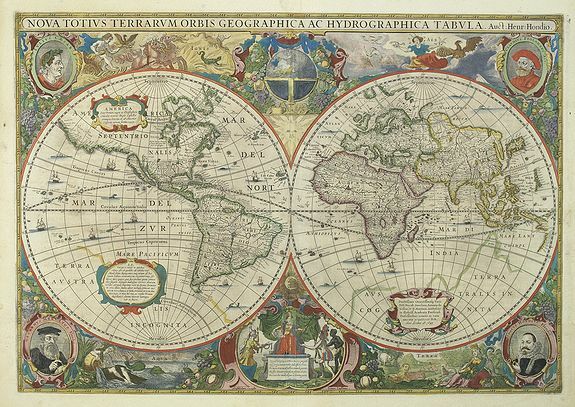 En outre, c'est la seule des 3 versions � porter la signature d'Ortelius. Les 4 cartes proviennent du m�me atlas et ont le m�me splendide coloris d'�poque. - Americae : In 1587, a new plate was engraved which appeared in editions from 1588 onwards. Of the three maps, this one is perhaps the most important. It is the most geographically advanced one, with the bulge in Chile removed, the Salomon Islands inserted and additional names, including C.Mendocino, added to the north west coast. Furthermore, this is the only one of the three plates which is signed by Ortelius as responsible for the preparation of the map. /Africae : Ortelius' depiction of Africa is based on Gastaldi's rare wall map of 1564, though with modifications such as the more pointed southern tip of the continent. The Ptolemaic notion of two lakes in central Africa as the source of the Nile is maintained./ Asiae : Ortelius' fine map of Asia well represents the continent at a time when Europeans were expanding their power in the far east. The Indian subcontinent and Malaysian peninsula are easily recognizable. Ceylon and Sumatra are correctly placed. The Philippines are distorted and Japan is too far north and incorrectly orientated, with the embryonic outline of the three main islands and with the Ryukus and Taiwan appearing as a tail of islands to the south of the archipelago./ Europae : Somewhat distorted land masses; vignette of Europe being carried off by the bull (Zeus). The second plate with title "AFRICAE PARS" now in Italic lettering. 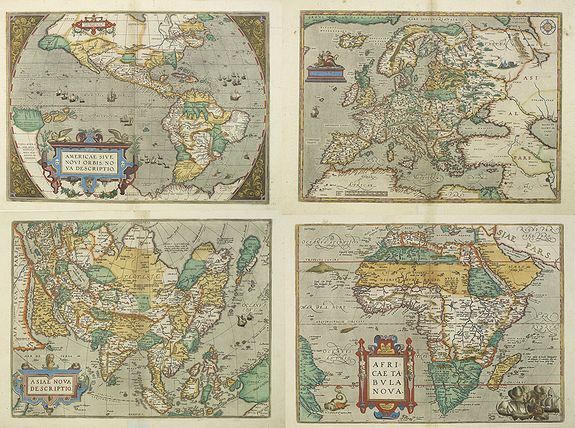 All 4 maps are from the same atlas with Latin text on verso (1595). Click to see map in this lot. 7 HONDIUS, H. Nova Totius Terrarum Orbis Geographica. Amsterdam, 1630. Beau col. ancien. Tr�s bel exemplaire en coloris d'�poque d'une tr�s grande fra�cheur. - Near to mint condition. With bright original colours. 380 x 547 mm. � Magnifique mappemonde, l'une des premi�res � figurer les d�couvertes des Hollandais en Australie. Orn�e dans les angles des portraits de C�sar, Ptol�m�e, Mercator et Jodocus Hondius. Deuxi�me �tat, � la date de 1641. - One of the most beautiful world maps ever engraved and one of the most influential in promulgating the California as an island hypothesis and one of the earliest maps to show the Dutch discoveries in Australia. A corner stone map for any collection of world or Australian maps. Portraits of Caesar, Ptolemy, Mercator and Jodocus Hondius occupy each corner, with symbols of the four elements, a celestial orb, various native figures, flowers and fruit. One of the earliest world maps (probably the second after Speed) to name Plymouth Colony. A second state with the date 1641 and "Amstelodami Excudit Ioannes Ianssonius" added at the bottom. (Voir reproduction en page 2 de couverture) Shirley, World 336, State 2. 9 BELLIN, J.N. Carte Des Variations De La Boussole Et Des Vents G�n�raux Que L' On Trouve Dans Les Mers Les Plus Fr�quent�es.. Paris, 1765. Sur papier fort uniform�ment jauni. Tache brune dans l'Oc�an occidental. - Printed on heavy paper. Paper slightly age-toned as usual. 559 x 872 mm. A well engraved and highly detailed chart showing the magnetic variations of the compass. Drawn by J. N. Bellin, this chart is based on Sayer & Bennett's chart that was issued in 1776 and was intended for use by the French Navy during the Revolutionary War. It shows soundings, anchorage's, channels, shoals, navigational sightings.